MATH AT IT’S FINEST; Harlow teaches 8th-grade students ordered pairs and relations. “Growing up, the Red Devils were always the arch-enemy back then,” said Harlow. He went to high school at Harrison. Mr. Harlow may be one of the new teachers in the math department, but he is definitely not new to teaching. He taught at Fountain Central for three years in the early 80s. He then taught at Frontier for 28 years and coached everything from Physical Education, football, basketball, cross country, golf, and track for eight of those years. 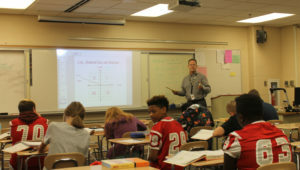 Due to his fondness and dedication towards teaching and coaching, he came back to teaching after four years of retirement. Since high school, Harlow’s favorite subject has been math and it continues to be so. He has taught all around from basic math to calculus, but mostly Algebra 2 and pre-calculus. His teaching philosophy is to try to help the students be the best they can. He said, “They need to give to me and I give to them so you’re only going to get out of it what you put into it.” Sometimes students don’t want to try to be the best at a young age; however, when they get to a certain age they’re expected to keep up with their grades.